Greetings From SHANKER TRAVELS !!!! 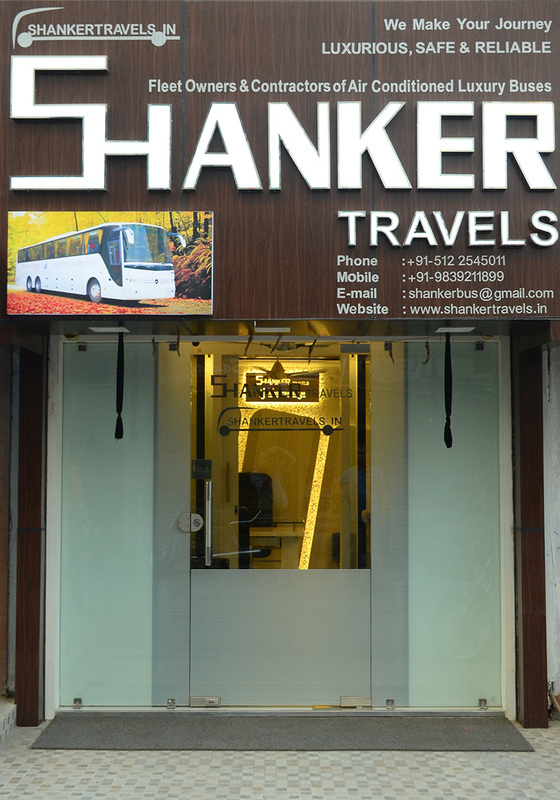 We at SHANKER TRAVELS, offer the best of public transport in the heritage city Kanpur & Lucknow (Uttar Pradesh) India. We are pioneer in public transportation having owned fleet of Air-Conditioned Luxury Buses, Tempo Travellers, Caravans & Cars of latest models. Steered by the pure motto of making travel more meaningful and much more explorative, this company has been functioning with innovation, coupled with purposefulness, thereby catering to the travel needs and peerless hospitality. Backing up an experience of over 3 decades, exemplifying the traditions of hospitality in the cultural ambiance of India, SHANKER TRAVELS has provided quality services in public transportation. As a Unique House of Air-Conditioned Luxury Buses, Tempo Travellers, Caravans & Cars, we have a fleet of 19, 45, 56 Seater's Coaches & Cars. We as a company, providing public transportation services to a variety of customers, including some that form a long term relationship with us, are goal - driven for excellence in customer satisfaction. Please feel free to explore our site at your leisure. If you have any queries, as to our services or their prices or anything else - do contact us.